The main attraction here is the Otaru canal, which was part of the harbour facilities. Other than that, there is really nothing much to see at Otaru. On our Hokkaido trip, Otaru is the most boring destination. If my friends ask me, I’d advise them to skip it. If you’re driving, you can stay anywhere in Otaru of course. But here, we returned the car to the rental company (you may want to do so too. I’ll give the reasons later.) So the best location to stay is within the red box in the photo. It’s from Otaru JR station to Otaru Canal along the main road called Chuo Dori. It’s about a 10-minute walk along Chuo Dori road from the Canal to the station. We stayed at Hotel Sonia Otaru and paid ¥15300 (S$190) for a room for 2 adults. Although it’s a 3-star hotel, it is rather fancy, decorated in an European theme. The room is also far larger than other hotels’ we were in and there are two queen sized beds. The toilet is also huge, not the prefabricated kind found everywhere in Japan. It even has a bathtub. Yeah, that’s how the loong kang looks like. Not great. 10 a.m.: Check out of your hotel at Niseko. And then have a leisurely brunch around Grand Hirafu. We had a great meal at Graubunden. 11.15 a.m.: Start driving for about an hour and 15 minutes to Yoichi district where Nikka Whisky Distillery. The founder of Nikka, TAKETSURU Masataka, was the first Japanese to study the art of making whisky at Scotland. And this distillery is the very first site he opened in 1934. I highly recommend visiting it. 12.30 p.m.: Reach distillery and have three free shots of whisky. 1.30 p.m.: Start driving from Nikka distillery. 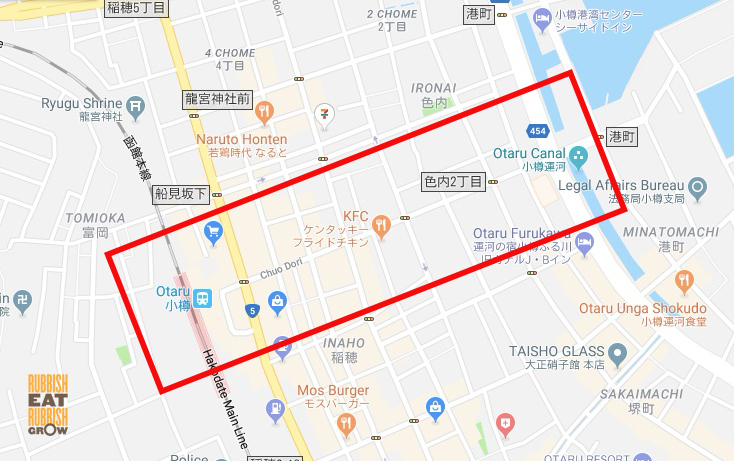 You can either drive straight to Otaru city (40 minutes) or drive to Herring Mansions (鰊御殿, Nishin Goten) and Former Aoyama Villa (旧青山別邸, Kyū Aoyama Bettei), which are 5km away from the city centre. We aren’t interested in the mansions and villa and didn’t visit them, but if you intend to, factor in an hour to 1.5 hours for the visit. After you visit them, drive to the Otaru city centre. 2.15 p.m: Here I dropped my friends off at the hotel and I returned the car to rental company. The reason is because there is really no need for the car anymore. Otaru is a small town, easy to walk around. The next and final leg is at Sapporo and we took a JR train there. Sapporo is a city, public transportation is advanced and convenient. If you’re hungry, you can take a light lunch, but we were still full from brunch. Check into the hotel and take a nap! Did I or did I not promise you a leisurely holiday? 3 p.m. or 4 p.m. (depending on how long you take to shop): Take a stroll along Otaru Canal (it’s about 50m or so only). At the end of the canal, you’ll come to Sakaimachi Street 境町通り. This long street houses many interesting shops that you can buy souvenirs. Along this street are famous pastry shops Kitakaro 北果楼 and Rokkatei 六花亭; Kitaichi Glass (Otaru is famed for glassware); Music Box Museum; and Studio Ghibli. Are you bored yet? 6 p.m. or 7 p.m.: Dinner. Otaru is known for their beer, and you can try the food and beer at Otaru Soko No.1 Brewery (5-4 Minatomachi, Otaru 047-0007, Hokkaido; +81 134-21-2323, 11am-11pm), a popular restaurant/beer hall with a medieval theme next to the canal. But we heard the food is bad at the beer hall so we went to the Michelin Bib Gourmand izakaya, Otaru Rakuten らく天, which is fantastic. 10 a.m.: Check with your hotel if they have a buffet breakfast providing sashimi. Our hotel only provides sushi, not sashimi, so we checked out of our hotel. Bring your luggage along with you to Sankaku Fish Market for breakfast. Luggage can be cumbersome but the fish market is just next to the JR station. It makes sense that after breakfast, you can immediately board the JR train to Sapporo. Really, can’t escape from Otaru fast enough. Run with lightning arms. Haha. Ok? Now let’s move on to Sapporo for Days 6 to 8. –Hilton Niseko Village Review, Hokkaido: Naked in Nature! Wild Wild Wet! Was reading your posts for your Hokkaido trip… but where is your post for Sapporo Days 6 to 8? And there will be one more on 6 April which is the last of the Hokkaido itinerary. Thank you! I’m planning a Hokkaido trip in June/July :) Looking forward to reading more.